We are experts in manufacturing exclusive range of nursery furniture, nursery classroom furniture that perfectly go with the nursery decor. Various factors are considered while designing nursery furniture because it is used by kids so the furniture has to be designed in such a way that they may not hurt themselves. This nursery furniture is durable, stylish, full of vibrant colors so as to meet with the interest of the children. We are offering of Kids Hexagonal Picnic Table. The product is made of 1" So ever pipe and top made of 18 mm thick laminated board. 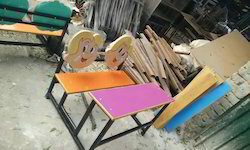 Our range of Classroom Furniture is offered in both wooden and mild steel finish at the most competitive prices in the industry and can be fabricated as per the requirements of the various clients. 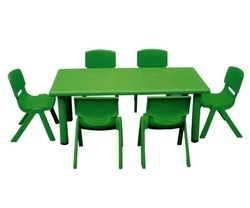 Trendy and comfortable, these Classroom Furniture pieces are renowned for their superior finish and durability. 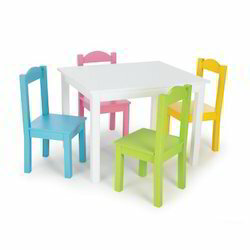 We are successfully ranked amongst the topnotch entity offering a wide range of Single Table with Chair for Kid. 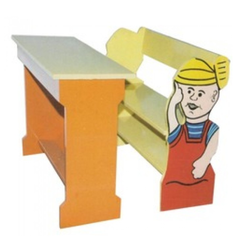 This single table with chair is manufactured using quality plastic. 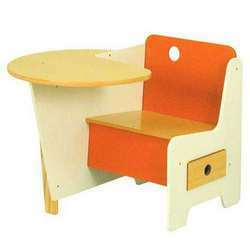 The set has a separate chair and table, especially developed for kids’ comfort. The offered table and chair is made available in a variety of colors and designs to engage the kids enjoying comfortable seating. In addition, we ensure to develop the table and chair adhering to furniture industry standards so that the set do not harm kids or cause any injuries. 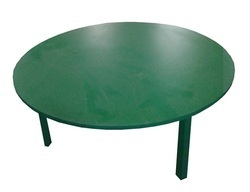 Leveraging on our in-house production unit, we are presenting a wide assortment of Kids Round Table Set. This set is manufactured using Assam wood frame, which is light in weight and delivers a long working life. The top of the table is laminated using color paint. 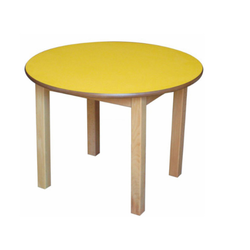 The offered round table provides perfect balancing due to four leg structure and comfortable height. In additions, this set is manufactured using adhering to industry quality norms. Furthermore, the set is taken through several quality parameters to ensure safety for the kids. Size 4" x 4" x 20"
Fruit Shape Table is made of Assam wood with top made up of 18 mm MDF board in the shape of Fruits. As one of the leading entity of this domain, we are engrossed in providing supreme quality Rectangular Table. This stylish and fashionable table is manufactured using quality materials and advanced technology. Our professionals manufacture all kinds of table according to the trending demands and clients’ needs. In addition, the offered table is built and developed adhering to industry standards. Furthermore, our professionals opt for strict quality inspection made on the table to ensure flawless performance. 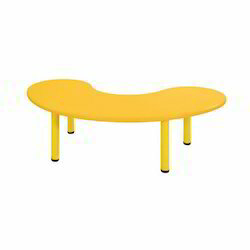 Besides, clients can get the table from us at industry leading cost. 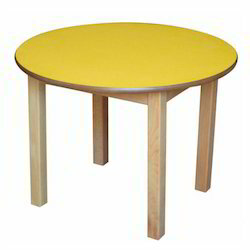 Size: 48" x 24" x 19"
Looking for Kids Furniture Table ?